Netflix is the best performing FAANG stock of 2018 so far, but that same outperformance is fuelling scepticism. Shares of the streaming company fell 2% Monday, with short-seller Andrew Left’s Citron Research saying the stock could slump to $US300. 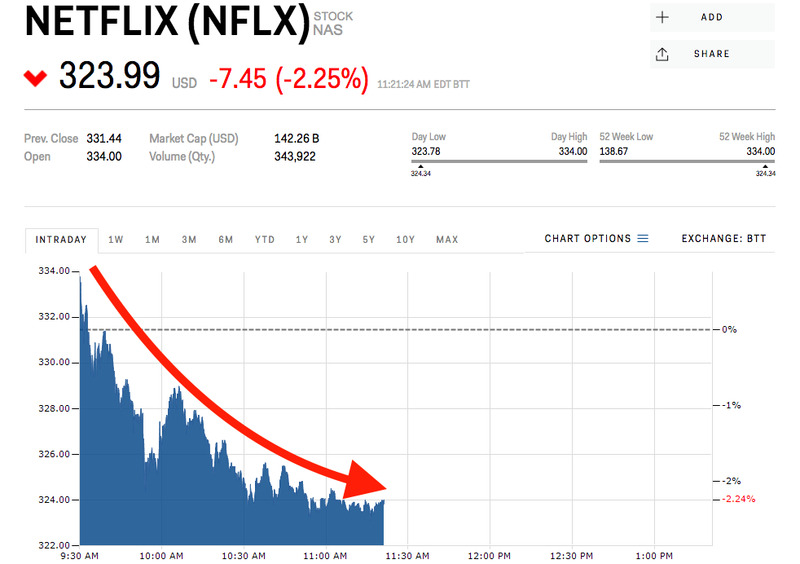 Shares of Netflix slumped more than 2% Monday morning after short-seller Citron Research said the stock could sink to $US300. Netflix has gained an index-beating 60% since the beginning of 2018 as the company hawks plans to spend as much as $US8 billion this year on 700 new shows. The stock is also beating its peers in the FAANG basket of Facebook, Amazon, Apple and Alphabet by a wide margin. Wall Street seems to have lost some of its enthusiasm for Netflix as it outpaces the market at large, too. Analysts surveyed by Bloomberg have an average price target of just $US273 for the stock – 15% below its opening price Monday. “This is nuts, when does Netflix crash?” Financial Times editor Dan McCrum asked in a column Monday, citing junk-rated debt and burning cash to the tune of $US0.5 billion per year. The company is certainly spending like crazy. Most recently it announced a deal with “Glee” and “American Horror Story” producer Ryan Murphy to the tune of $US300 million. It’s a move that could help it continue to carve a global content “moat,” but also one that is clearly fuelling the debate. Still, the company continues to top expectations, beating Wall Street’s forecasted subscriber growth on its last earnings report in January.